New Jersey-based artist Gregory Halili carves elaborate bas-relief skulls out of mother of pearl shells, and the result is simply amazing. The artist's unique collection will soon be on exhibition at Silverlens Galleries in Manila and Nancy Hoffman Gallery in NYC. Inspired by the nature and wildlife found in his native country, Halili carves the skulls into raw, gold-lip and black-lip mother of pearl shells collected from the Philippines. To give more depth to the carved images, he uses gouache to hand paint the shell with opaque tones and just the slightest hints of color. The meticulously carved shells come in all sizes, with the miniature versions ranging from 1×1 inch to 4×12 inches. In addition to the mother of pearl skulls, Halili has spent the last three years using his intricate detailing to create a series of cityscape images of New York. The series will also be on display at the Nancy Hoffman Gallery in NYC. 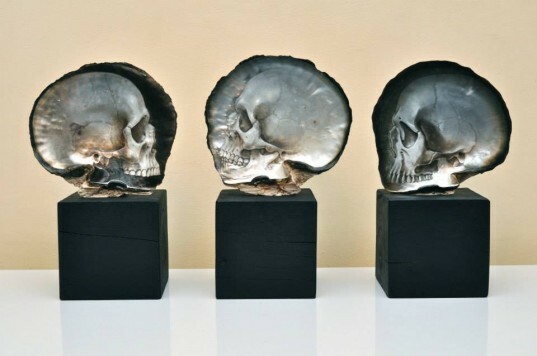 Inspired by the nature and wildlife found in his native country, Halili carves the skulls into raw, gold-lip and black-lip mother of pearl shells collected from the Philippines. To give more depth to the carved images, he uses gouache to hand paint the shell with opaque tones and just the slightest hints of color. The meticulously carved shells come in all sizes, with the miniature versions ranging from 1x1 inch to 4x12 inches. In addition to the mother of pearl skulls, Halili has spent the last three years using his intricate detailing to create a series of cityscape images of New York. The artist's amazing collection will be on display at the Nancy Hoffman Gallery in NYC. 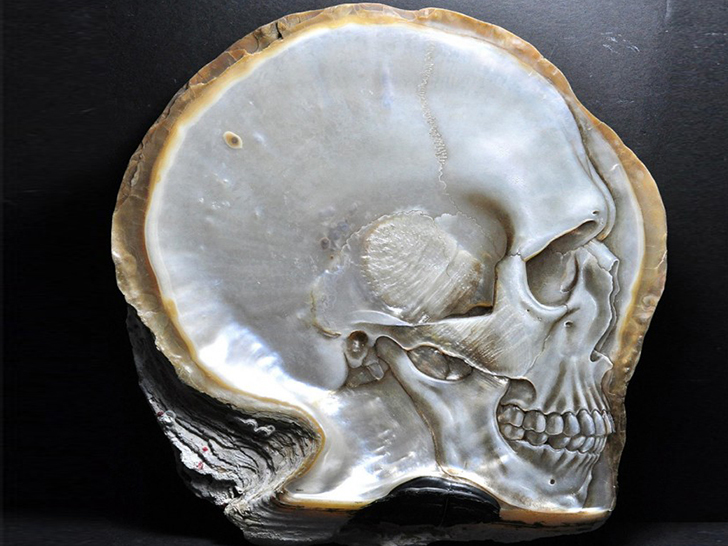 Halili's mother of pearl skulls show an amazing eye for intricate detail. The artist creates the skull images in a variety of sizes.